What’s a weekend without wifi? Sitting outside the RV before sun-up this morning. Chilly, around 50 degrees and no wind. The sky is brightening but no sunlight hitting the trees high all ‘round us. 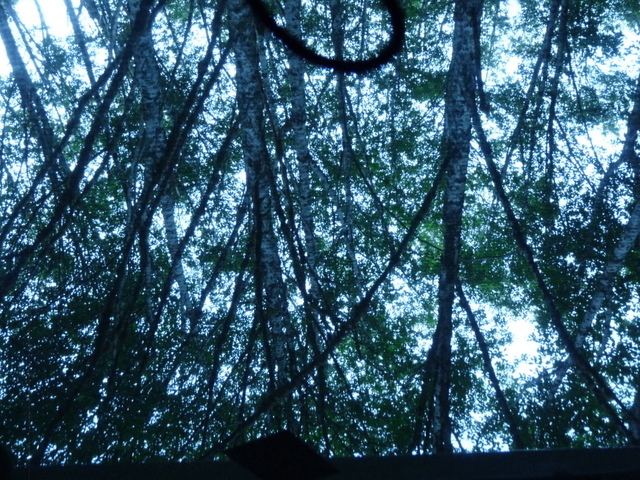 Strong steady whishing noise from through the trees south and west of our RV, must be Sol Duc River. The river isn’t large or deep, but has that nice whitewater rushing water sound. Debbie says this one sounds like white noise. Before leaving bed, grabbed a camera to capture this view from the pillow through our bedroom window. The nice part of camping in the forest or a field almost anywhere — leave the shades open at night. No streetlights burning brightly in, just pitch black everywhere. It helps we’re under a new moon and amongst densely-packed tall trees. Clear skies, unlike most times last week in Lacey, if we look straight up in this small clearing. 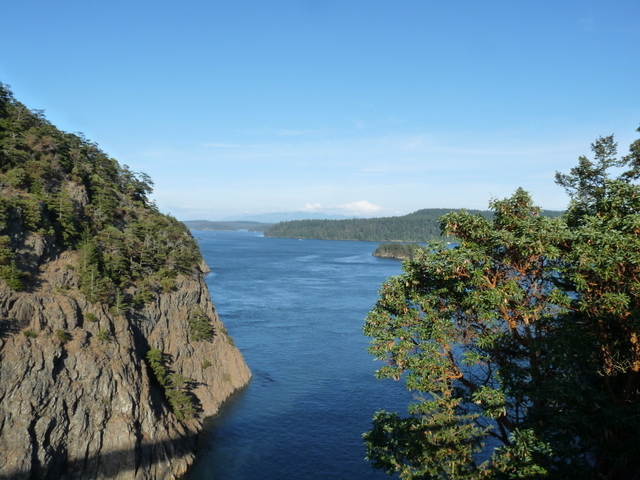 We drove 101 north from Olympia along Hood Canal (not a canal at all, but the sole glacier-formed fjord in continental USA, 600 feet deep and huge) through a series of small towns. Much of this we recognized from our visit two years ago with a WBCCI caravan, National Landmarks West. 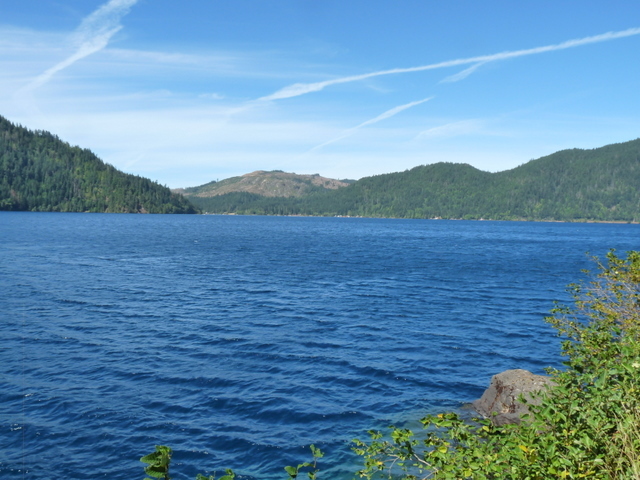 Through Port Angeles we drove and onward alongside Lake Crescent, a large and deep glacier-formed beautiful blue lake ringed with tree-covered slopes. We were surprised not a single sailboat was on the lake despite steady winds across the water (We read later, personal watercraft not allowed on this lake). The day is a little cool – are they awaiting a warmer day? 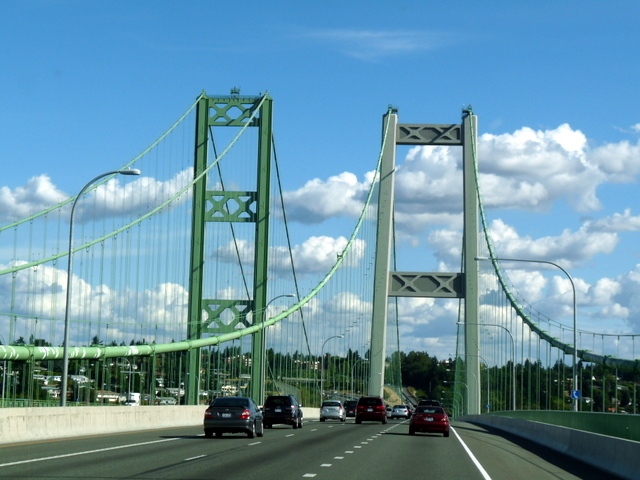 The road from 101 into Olympic National Park evoked memories of Natchez Trace in Tennessee, a paved long and narrow road through the forest. But this road to Sol Duc Resort Campground is through old growth Douglas firs, every other one seems six feet and greater diameter. 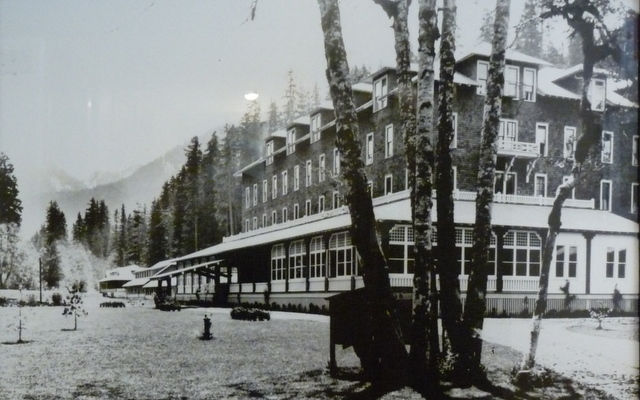 More than 95 years ago was built a four-story resort at these Sol Duc hot springs. The picture of the resort evokes thoughts of the grand destination lodges built by the American and Canadian rail line companies in the late nineteenth and early twentieth century. But this one lasted only four years before it burned to the ground. 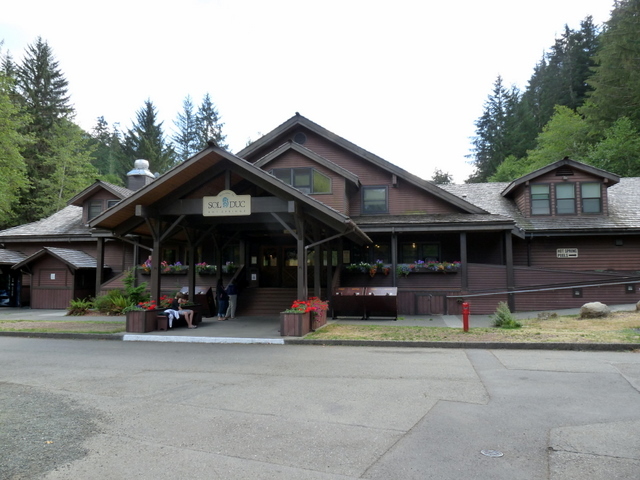 Sol Duc has two campgrounds, the National Park one and the “Resort” one. The latter has 20 sites and electricity and water hookups but no comfort stations or toilets. The former has 82 sites, no hookups but vault toilets. The national park one has paved roads and sites. The resort is dirt and rocks. We’re in the Resort campground. For the $32 per night price we were expecting to be a little wowed. Far from it, though — this is a gravel parking lot with railroad ties defining camping spaces between 13 and 18 feet wide. And the utilities post sits at the back edge, each serving two sites. Space is tight, sites are not deep enough to park the truck lengthwise in front of the trailer and aren’t wide enough to park the truck crosswise. We moved our truck this morning to provide a departing camper necessary clearance. The Resort is a small two-story lodge building, pools, and collection of small KOA-style cabins situated on the other side of the river, 300 yards from our campsite. 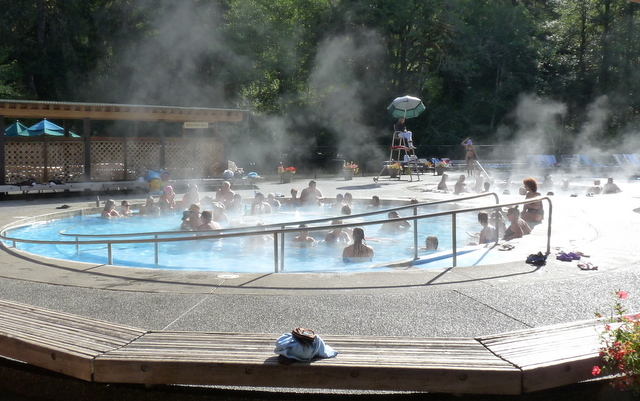 Three 25’ diameter wading pools are the hot springs. And a 60’ long unheated swimming pool attracted no adults during our brief reconnoitering. The “lodge” houses offices, a gift shop, a small camping store with beer, charcoal lighter, firewood, marshmallows (the things you wish you hadn’t forgotten). And there’s a restaurant. But no wifi, no lounge area to hang out. 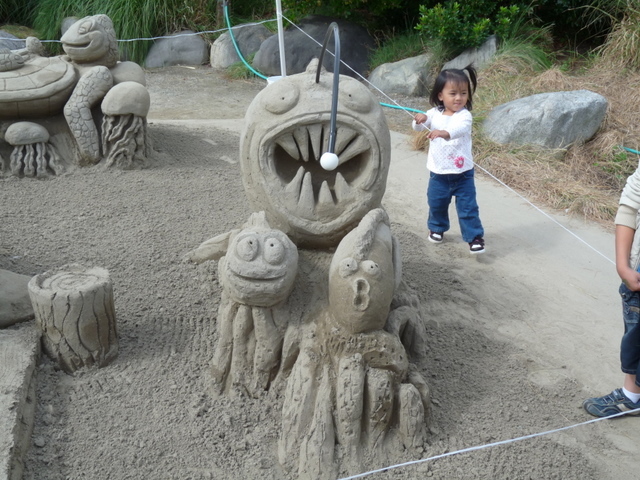 We’re a lot surprised an area calling itself a resort lacks these. Lest you think we’ve lost sight of who and where we are, we’re not complaining about the accommodations. We only are commenting. Television holds no attraction for us, wifi and phone service are conveniences we’re fine without. Well, sort of fine, we think. But how will we spend our time? We’re in a designated wilderness area and need to take full advantage of the benefits. This is an incredibly gorgeous national park. We’re glad we’re here. Numerous hiking trails provide us opportunities for seeing more of the old growth forest, and the river’s falls, and some nearby lakes. We’ve met nice folks. And it IS dark and quiet at night, as we said. Let’s go hiking! The resort provides a trails map indicating several hikes and mileages. Our first day out we don’t need a long hike, maybe a couple or three miles. We chose one listed as 0.8 miles each way. It doesn’t say, and we didn’t check, the starting location. It would have been a good idea. 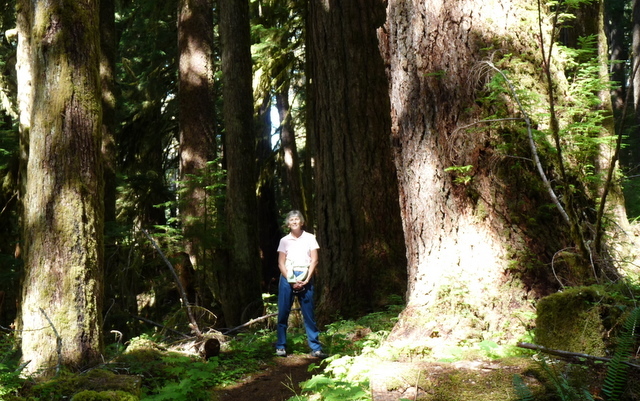 How big are these old Douglas Firs? 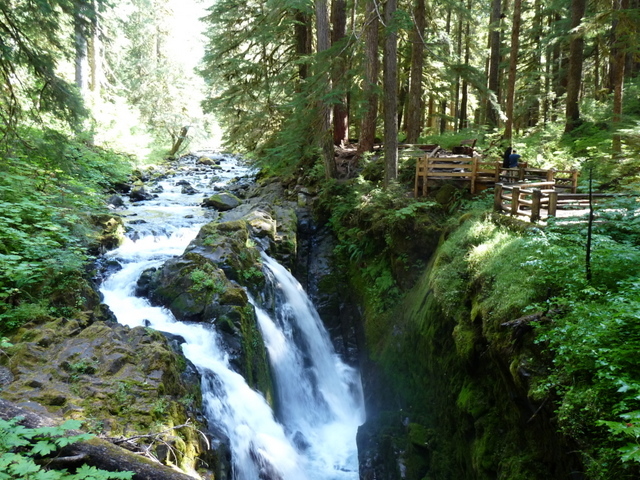 The trail is Sol Duc Falls trail from one side, and is named Lovers Lane loop from the other end at the resort. It’s a very nice walk up one side of the river to the Sol Duc River falls and back the other side of the river through old growth forest. On closer inspection, after our hike, the map shows distances for each trail from the trail’s respective trailhead. Makes sense, but means you either drive to the trailhead or add the walking distance from campsite to trailhead. One pool is pretty warm at 104 degrees, one is less so, and one is barely warm. We spent over an hour in the warmest pool, kneeling on the bottom so water was up to our necks. The pool was so crowded, at 4:30 in the afternoon, we felt like sardines packed in a tin. A movement back or left or right and we bumped into someone. And four of five of the someones were non-English speaking. We thought we recognized Russian, German, and Japanese, but we weren’t certain. We heard almost no English amongst the over one hundred people crammed into this warm pool. Fortunately, 5:00 rolled around and enough people trickled out to make more room in the pool. 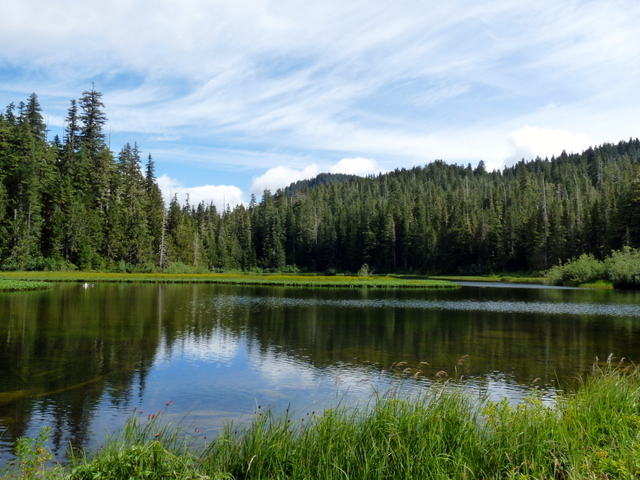 Our third day we hiked to Mink Lake, a 5.2 mile round trip with 1,500 feet elevation gain. We passed through stands of very tall Douglas firs and were amazed at the great piles of fallen trees we frequently saw from the trail. The hike up to Mink Lake took a little longer than the return trip for only one reason: blueberries. We stopped ten minutes on our way up to pick and eat blueberries. Most were not fully ripened but we each ate a half-cup of pretty good berries. We couldn’t have denied it either — our hands were deeply stained from some of the ripe berries. Mink Lake seemed small, maybe an acre or two at most. An old backpacker’s shelter and fire ring provide one of several designated campsites for backpackers. Blueberry bushes abound on the lake’s south shore and the berries are larger and in clusters instead of singles like we found on the trail. We donned our fleeces and sat in the very cool afternoon long enough to share a snack bar. Sunlight was fading and air temperature, which hadn’t exceeded 60 degrees, was falling. So we packed up and hiked back down to our silver home at Sol Duc Resort. Absent any wifi, we spent more time reading, hiking, and writing. We’re craving connectivity, but appreciating the calm and un-busy nature of our days here. This has been a nice visit in a very nice forest. Maybe the resort has it figured out after all? Today, Labor Day, it’s pouring down rain in Forks, 15 miles west of Sol Duc. 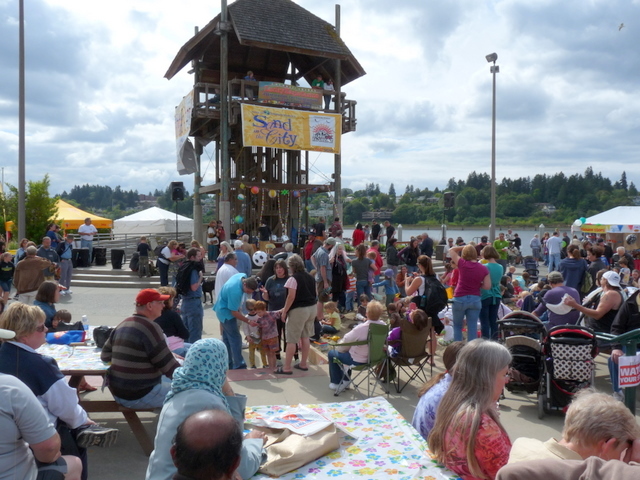 We’re in the Thriftway Outfitters/Grocery/Bakery, adjacent to the Dew Drop Inn (yep, another one). 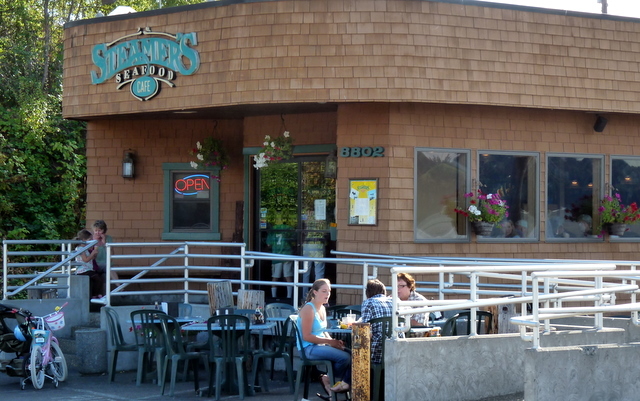 Every other storefront in Forks includes either a store name or a feature with “Twilight”. We had no idea whatsoever, never heard of Twilight series before. Different layers of life — even frequent wifi doesn’t reveal all. . .